A divorce can be one of the most difficult situations a spouse can go through. The emotional impact can be devastating particularly for the spouse who did not see it coming. So what can you do then if your partner tells you he or she wants a divorce? What are the best steps to take to make the process less stressful? If you’re not sure about what to do next and you have a strong feeling that your marriage can no longer be saved, you may consult a divorce lawyer first. This way, you get the proper information and advice on the process and what to expect from it. One of the first things you would be asked if you have a prenuptial agreement. This particular document states the properties owned by each spouse before they tie the knot and what will happen to them should the marriage fail. In the absence of a prenup, the spouses can still come up with a post nuptial agreement. This written agreement is similar to the prenup although it is just executed after they get married. Again, this document that must be signed by the spouses lays down the couple’s assets and how they are going to be distributed in the event of a divorce, separation or death. In recent years, legal professionals have noted a rise in the spouses who seek post nuptial agreements. A 2015 survey done by the American Academy of Matrimonial Lawyers showed that half of divorce lawyers confirmed this. 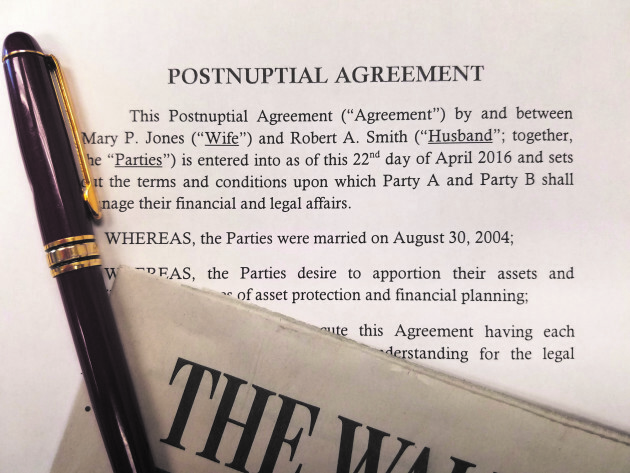 One of the factors that led to the rise in couples signing postnups is the increase in the number of people with multi-million dollars worth of assets. On the other hand, many wives also opt for it particularly if at some point of their marriage, they would be forced to stop working to take care of their children leaving them with no income unlike when they were still holding a high-paying job. It has been occurrence particularly among working couples to decide that one partner, in most instances the mother, should give up her career to attend to their kids. How Beneficial is a Postnup? With a post nuptial or post marital agreement, a couple can decide to stay together but on certain conditions. For example, a wife wants a divorce but the husband is not amenable, the wife can use the prenup to state what she desires in the event their marriage gets shaky. “In the U.S., rules on postnups vary from state to state,” said lawyer Hossein Berenji, a divorce attorney in Los Angeles. Some have clearer rules compared to the others. Unknown to many, a Uniform Premarital and Marital Agreements Act had been enacted into law but only in two states – Colorado and North Dakota, he added. The 2015 survey of by the American Academy of Matrimonial Lawyers revealed that among the issues covered in postnups, the most common pertain to division of properties, alimony or spousal maintenance, retirement accounts, who will stay in the house and legal fees. Legal experts have pointed out two common reasons behind the rise in postnups. The first is time constraints before the wedding forcing the couple to set aside getting a prenup. The second reason is the couple may be experiencing a rocky marriage but would want to give their marriage another chance. For the experts, the second reason is understandable and can actually help the couple save money from an expensive divorce. It is considered a better option than when a couple decides to negotiate after their marriage has officially ended. It should also be noted that post nuptial agreements are different from the legal separation agreements. The latter is a contract between spouses who are planning on a divorce but are still working out on certain details. How Can You Tell If You Need a Lawyer?